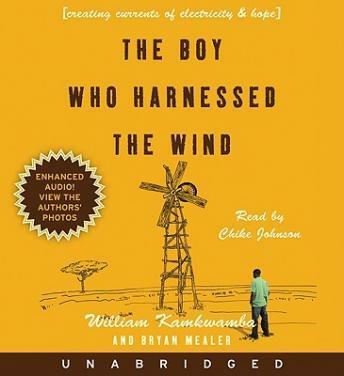 Listen to "Boy Who Harnessed the Wind" on your iOS and Android device. William Kamkwamba was born in Malawi, a country where magic ruled and modern science was mystery. It was also a land withered by drought and hunger, and a place where hope and opportunity were hard to find. But William had read about windmills in a book called Using Energy, and he dreamed of building one that would bring electricity and water to his village and change his life and the lives of those around him. His neighbors may have mocked him and called him misala"•crazy"•but William was determined to show them what a little grit and ingenuity could do. Enchanted by the workings of electricity as a boy, William had a goal to study science in Malawi&apos;s top boarding schools. But in 2002, his country was stricken with a famine that left his family&apos;s farm devastated and his parents destitute. Unable to pay the eighty-dollar-a-year tuition for his education, William was forced to drop out and help his family forage for food as thousands across the country starved and died. Yet William refused to let go of his dreams. With nothing more than a fistful of cornmeal in his stomach, a small pile of once-forgotten science textbooks, and an armory of curiosity and determination, he embarked on a daring plan to bring his family a set of luxuries that only two percent of Malawians could afford and what the West considers a necessity"•electricity and running water. Using scrap metal, tractor parts, and bicycle halves, William forged a crude yet operable windmill, an unlikely contraption and small miracle that eventually powered four lights, complete with homemade switches and a circuit breaker made from nails and wire. A second machine turned a water pump that could battle the drought and famine that loomed with every season. Soon, news of William&apos;s magetsi a mphepo"•his &apos;electric wind&apos;"•spread beyond the borders of his home, and the boy who was once called crazy became an inspiration to those around the world. Here is the remarkable story about human inventiveness and its power to overcome crippling adversity. The Boy Who Harnessed the Wind will inspire anyone who doubts the power of one individual&apos;s ability to change his community and better the lives of those around him. This is a very good book that deals with young William's life and a vast path of ingenuity to create helpful things from junk for him and his African village. The narrator's voice makes the story feel real life and sound like the reader is part of the adventure of Kawkwamba...I had to read this book for AP Environmental, but I actually ended up enjoying this book and would highly recommend it to anyone. I loved this book. It got off to a slow start but was compelling after that. I had a little trouble a few times with accent, but overall enjoyed the narrator and the energy and passion he put into the reading. I thoroughly enjoyed this book....The marvelous and intriguing windmill story is great but actually is a story within in a larger Malawi history and culture story. Truly an amazing and inspiring account! The readers accent wasn't that difficult and I think added well to the authenticity of the experience and helped learn how the Malawi culture words were pronounced. I found the story compelling enough to buy the book to have in my personal book library and to provide to others to read.. The heavy accent is a little annoying to begin with, but once I got in to the story I forgot about the accent. The story is really inspiring and the book itself is amazing! An hour into listening to a book that is pegged at 10 hrs, I simply had to stop. I was looking for a story about a boy who had built a wind turbine. I'm not going to wait hours for that story. so far the narrative has had nothing to do with building a windmill. Additionally I find the reader's accent to be nothing less than irritating - and I'm an African American.